Time for a weekend treat. These are “Sticky Pecan Caramel Rolls” from Artisan Bread in Five Minutes a Day, which is my favorite book/method for making bread overseas. But of course, you guessed it! – we needed to make a few substitutions. Pecans must be ordered online and are prohibitively expensive, so the only time we have them is if they come in a care package. That means our breakfast became Sticky Almond Caramel Rolls. And I ran out of brown sugar, so some of the filling had white sugar instead. This recipe uses an incredible amount of butter, mostly because the dough is brioche dough. 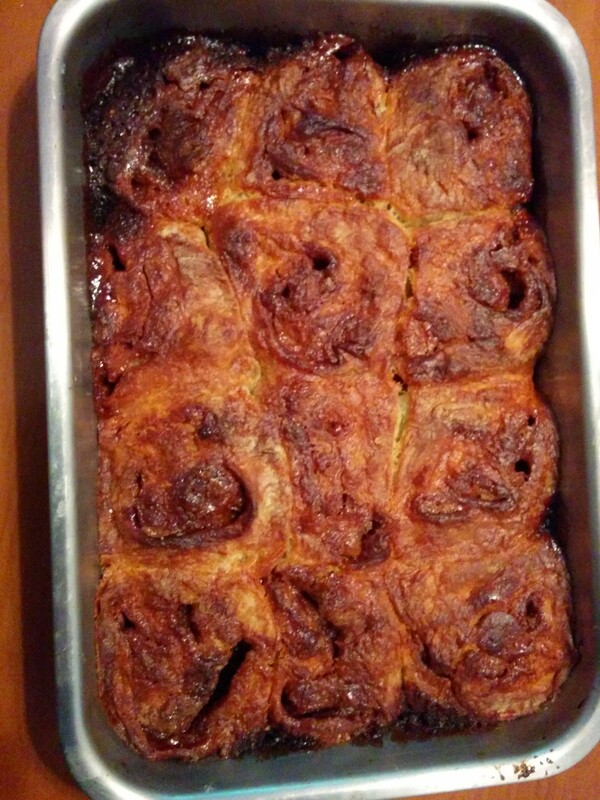 This was our first time making these rolls and they were very good. Crispy and flaky on the top (forgot to invert them), gooey and sweet on the bottom. They got a thumbs-up from all of us. For lunch, we went out with friends to a little hole-in-the-wall place we all like. I forgot to take photos of the food until we were paying the bill, so here is the not-so-beautiful table when we were done eating. The dishes were Japanese tofu with golden needle mushrooms (my kids’ favorite dish at this restaurant), black pepper beef with green peppers and onions (my husband’s favorite dish at this restaurant), cucumber slices with pork, kugua (bitter melon) and beef, and eggplant and pork. 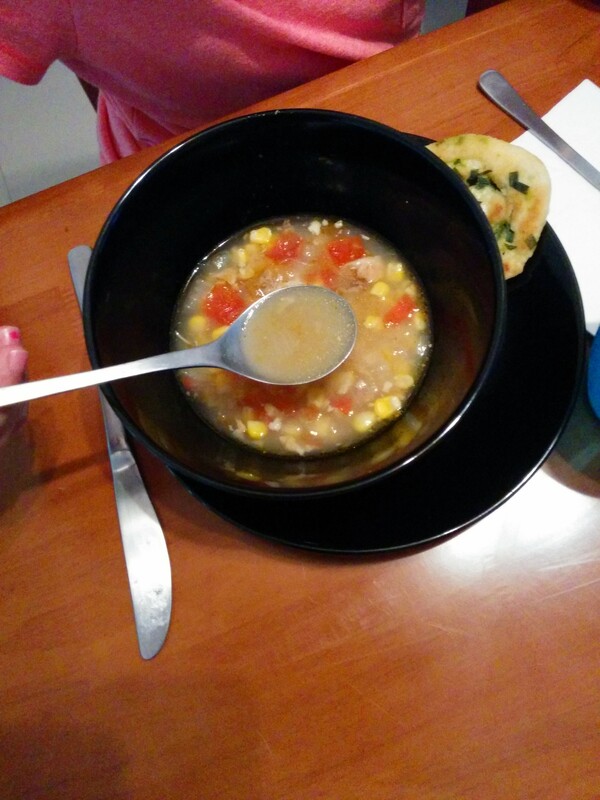 Each person also got a bowl of soup with pork and chunks of corn-on-the-cob. A close-up of the kugua and beef. I guess it wasn’t the favorite. That probably makes more sense in Chinese. On the weekends we try to eat up any leftovers from the week. 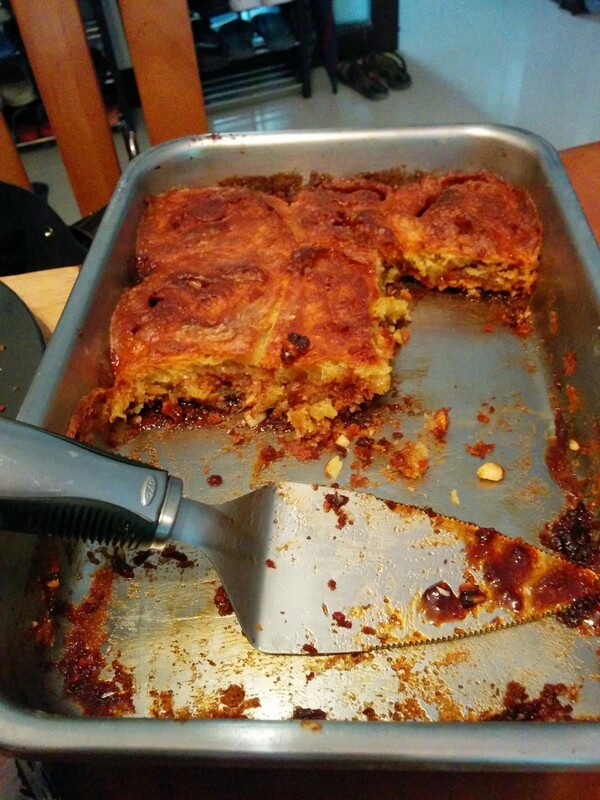 Sometimes there’s not much left over, so we end up beefing up the meal with frozen jiaozi, or peanut butter bread, or possibly just going out to eat. The first picture is some sweet potato curry with green onion naan-like bread. 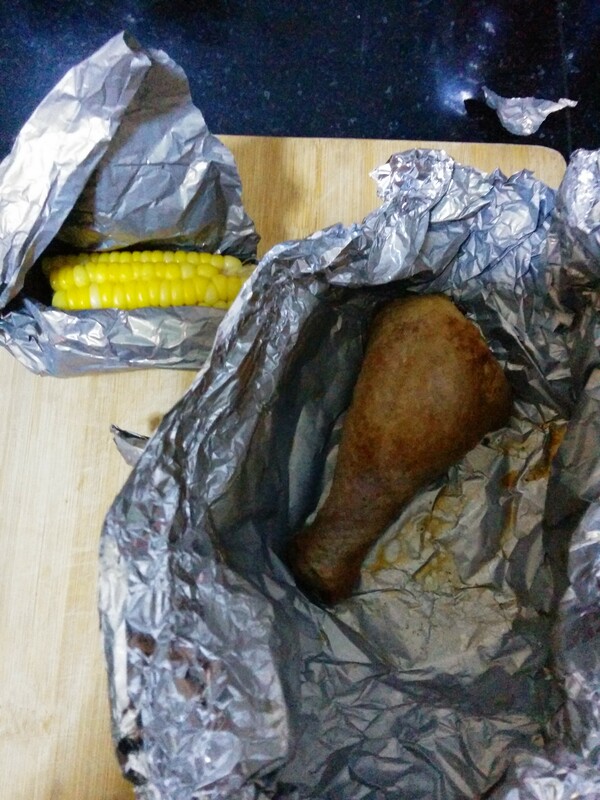 The second picture has a chicken leg from earlier in the week and a cob of corn. Lastly, there’s something like tortilla soup. After we’re through with the weekly leftover smorgasbord, we usually dump out whatever is left over of the leftovers 🙂 because stuff doesn’t keep as long here as it would in the U.S.
Well, that’s it! A whole week of good eating here in little ol’ Podunkville, China. Nothing terribly gourmet or glamorous about it, but we are happy and well-fed. And we manage to survive without eating fried chicken sandwiches every day.